It’s a new month and there are new ways to save at some of the more than 50,000 restaurants on OpenTable. Check out April 2019 restaurant weeks and enjoy discounted dining in a city near you, whether it’s a weekday date night with your partner or you’re taking your whole family out for a fun meal at a local favorite. * East End Restaurant Week is your chance to dine at the best of the Hamptons for less with $29.95 dinners through April 7. Make a reservation. * Western New York Local Restaurant Week is a terrific opportunity to support the restaurant community with $20.19, $30.19 + $40.19 meals through April 7. Make a reservation. * BC Wine Month invites you to swirl, sip, and explore British Columbia wines at participating restaurants offering a variety of local vintages and paired menu items through April 30. Make a reservation. * Giro d’Italia Italian Restaurant Week brings a taste of Italy to Toronto with four-course $32 lunches and $52 dinners, April 4-14. Make a reservation. * Jersey Shore Restaurant Week comes to shore this month with $12 + $15.19 lunches and $22.19, $32.19 + $35.19 dinners, April 5-14. Make a reservation. * Newport Restaurant Week starts soon in New England with $20 two-course lunches and $30, $35 + $50 three-course dinners, April 5-14. Make a reservation. * Seattle Restaurant Week is your ticket to $35 three-course dinners (and $20 two-course lunches at select restaurants), April 7-18. Make a reservation. * City Restaurant Week-Wilmington is a great way to sample the creative cuisines of Delaware’s finest dining spots with $15 lunches and $35 dinners, April 8-13. Make a reservation. * Greater Cincinnati Restaurant Week has $26 + $36 lunches and $26 + $36 dinners for a cause; $1 from every meal benefits Cincinnati Children’s Hospital, April 8-14. Make a reservation. * Dining Out for Life-Philadelphia is happening April 18th. 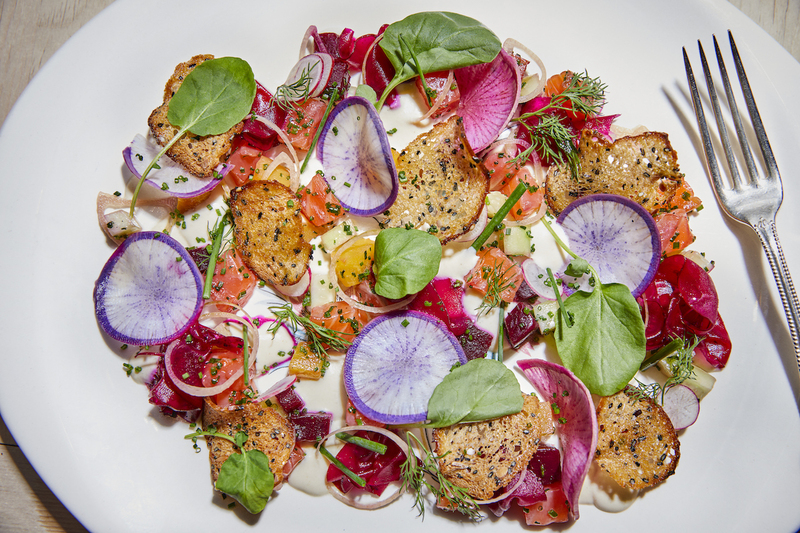 Dine out at a participating restaurant including Talula’s Garden (pictured above) and 33% of your bill will be donated to Action Wellness and other area AIDS service organizations. Make a reservation. * Dining Out for Life-New York is on April 25th. Dine out and a percentage of the price of your meal will be donated to help the Alliance for Positive Health. Make a reservation. * Visit Bucks County Restaurant Week is the first-ever, countywide restaurant week. Enjoy spectacular $25 + $35 dinners, April 28-May 4th. Make a reservation. * Long Island Restaurant Week arrives later this month with $29.95 three-course dinners, April 28-May 5. Make a reservation. Check back for the launch of additional April 2019 restaurant weeks in other cities, and share your experiences with us here in the comments or over on Facebook, Instagram, Pinterest, or Twitter. Also, remember to snap + share your #dishpics with us on Instagram for a chance to win in our weekly giveaway.